Last weekend we went to Nanjing and said goodbye to our friends there. We went to an evening picnic at the Ming Tombs and I saw some fireflys. They were cool. They were bright little flying lights - but not bright enough to read a book with. One of the boys there had an electric bug killer that looked like a tennis racket. It turned mosquitoes into sparks! The next day we bought one from Walmart. Dad thinks it is great. Aunty Kirsty is coming here for a few days at the end of her Chinese holiday. After that we leave Jurong and go to Disneyland in Hong Kong before flying back to New Zealand. I'm REALLY looking forward to getting home. When Gran was here we stayed with some friends in Nanjing. One night there was a snake on the bed-head! It was about 60cm long and 2cm thick. 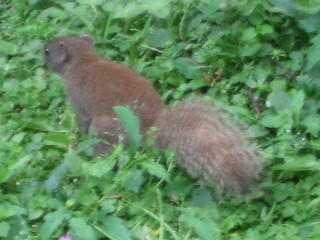 It took Dad and Mr Dean quite a while to capture it because it moved quite fast. They gave it to the guards. Next time Dad isn't going to chase snakes in bare feet. It is very hot here now. Some days it is 27 degrees during the day and night. We are glad to have airconditioning in the lounge and bedroom so we can cool it down to 25 degrees. The mosquitoes are starting to be annoying now. and we have nets over our beds. We don't do many different things now :( so I haven't had much to tell you for a long time. Gran came to visit us late last month. We've had a great time with her. Today we said goodbye to her and Dad took her to Shanghai to catch her plane to New Zealand. When she was here we visited Shanghai and saw the Pandas at the zoo. 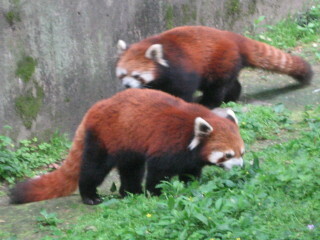 The Red Pandas and squirrels were my favourite. We also went to Suzhou and saw the cool fountains again. We stayed in a nice hotel for a change. Dad took Gran to Beijing to see the Forbidden City, the Summer Palace and the Great Wall. I wanted to see the Great Wall but I didn't want to spend 2 days walking around the other places first so I stayed home with Mum. Do you like my model aeroplane? Dad helped me build it today. We followed all the Chinese picture instructions! This is my first rubber band model plane. It flies really well. I'm having lots of fun with it. Even when we have to fix it and get it out of trees. I don't have much to tell you about because there is nothing different happening. It is a little bit boring but I have got some great new DVDs to watch: Valiant, Happy Feet and Monsters Inc. Looking for my older blog entries? Copyright © 2006 Sam Allison, All Rights Reserved.